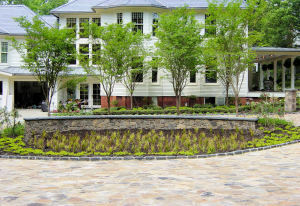 Natural Designs has been offering homeowners throughout Cary original landscaping design and installations for 20 years. We pride ourselves on creating a backyard oasis that will make you proud and be a great place to relax and entertain your friends and family. Owner, Michael Kopcienski, is an experienced hand when it comes to Cary landscaping. He works hard to understand what your vision is and to give you the options that will delight your senses. From outdoor living projects, such as a fireplace, kitchen or fire pit, to installing beautiful walkways, plantings, water gardens and more, Natural Designs is your choice for it all! We got several quotes on a backyard patio and pond. Natural Designs developed sketches and a plans that were the best fit for our project at the right price. Mike, the owner is very professional, does what he promises, and shows up on time. Once we agreed to the project, we continued to deal with Mike, and he was on site working many days. This gave us great continuity, and he took a personal interest in our project which came out quite beautiful. We had a couple of glitches, for example, months later some of the lights stopped working due to the cold weather. I bring this up because I called him one day, and Mike was personally out the next to fix it. You could not ask for more. I watched the guys on his crew do our stone work, and they were meticulous in getting a good fit and aesthetic look. A month after they finished, it looked like the patio had been in our yard for years.